Do you know what a pumpkin looks like flying by at 900 miles per hour? Me neither. 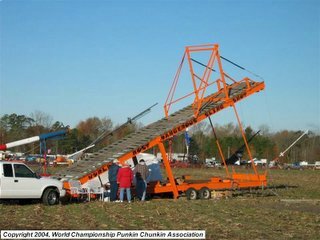 Joy, Jason, (the J2), and I drove out to the middle of nowhere Delaware today to see the great 2005 Punkin Chunkin. Somehow I was envisioning pumpkin carnage, explosions, kabooms, and flying orange bombs. But it turns out the punkins chunk at 900 mph out of all sorts of interesting cannons and "sling shots." You can't really see a pumpkin as it flies by that fast. 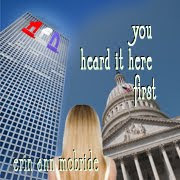 So we gave up before too long and decided to see what there is too see in the tax-free state. The ocean, J.Crew, LL Bean, the Gap, Old Navy, Banana Republic, Aeropostale, and a few other economy supporting activities filled the remaining 12 hours of our day. All I have can say is 1 pair of pants and 4 shirts for less than $30 thanks to clearance sales and no sales tax. It was a good time...thanks for coming with.